I set the (sensorReading<1000) based on my available light's reading on Arduino serial monitor. The mechanism how the values are being printed is described in Arduino Analog vs digital pin. So, for your need, (sensorReading<1000) may be lower or higher than 1000. Secondly, you can add multiple LEDs by simple modification. In real life, we need this action for electric lights. That will need using an Arduino relay module. So, with one Arduino, one LDR, one resistor, one relay module, we can actually control many household bulbs in real life. Commercial unit for the same action would cost higher if you build the Arduino from components or use cheap China clone. Furthermore, you can adjust the value for different seasons. This Article Has Been Shared 4279 Times! Here is Circuit Diagram and Schematic To Build Automatic LED Control Using LDR and Arduino Project. It is Very Easy, Cheap and You Need Only One LDR, Resistor and LED. 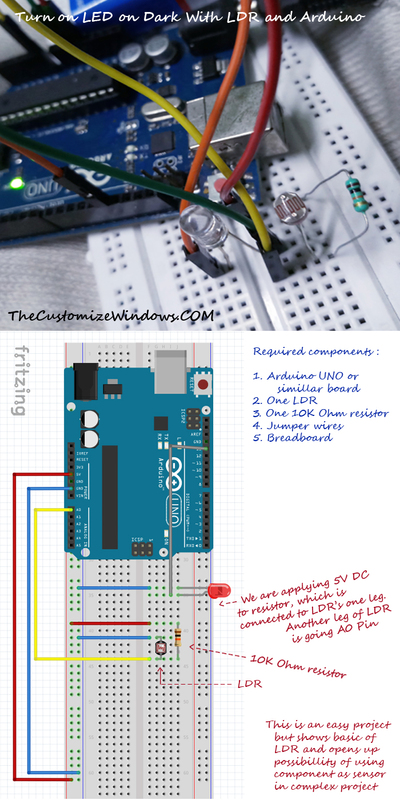 Cite this article as: Abhishek Ghosh, "Turn On LED in Dark With LDR and Arduino," in The Customize Windows, May 10, 2018, April 21, 2019, https://thecustomizewindows.com/2018/05/turn-on-led-in-dark-with-ldr-and-arduino/.